I am going to miss eating salads. I wish I liked them in cold weather, but I just don’t. So I’m filling up on stuff like this until the temps starts to fall…. 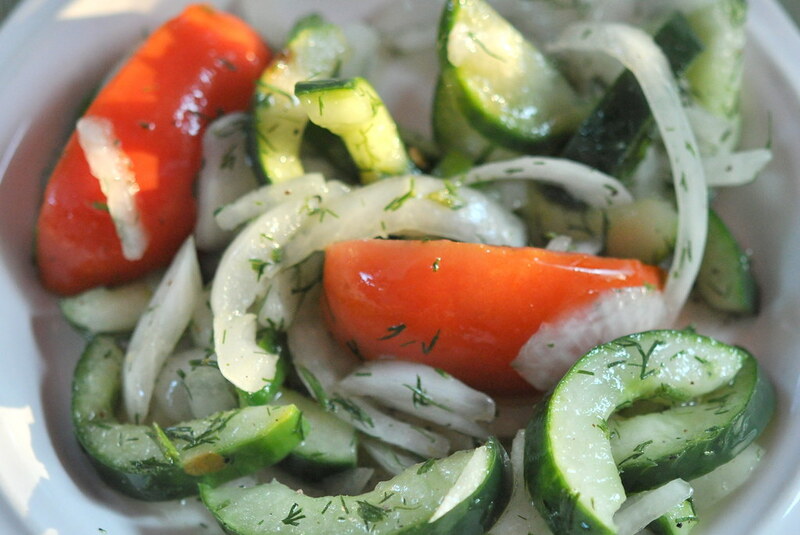 Cucumbers and onions go so well with tomatoes and dill, don’t you think? 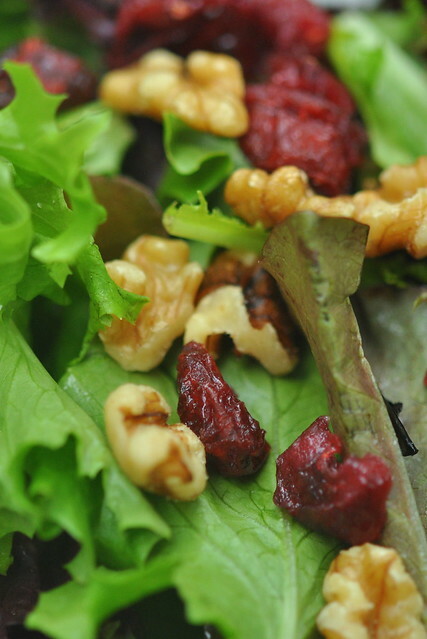 How about red and green lettuce with dried cranberries and walnuts? Maybe add some green onions and crumbled Gorgonzola…. The other night I tossed together some strawberries, mangoes, coconut, pecans and golden raisins. 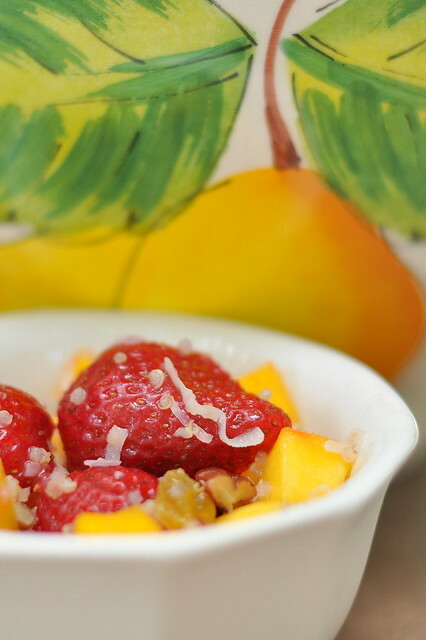 A slight coating of orange blossom honey made it a light and refreshing fruit salad. Or dessert, if you’re watching calories. Great weekend, everyone! Monday is a holiday in the U.S. (Labor Day) but I’ll post a photo. This entry was posted in cooking, photography and tagged cucumber salad, dried cranberries, fruit salad, Gorgonzola cheese, lettuce, tomatoes, walnuts. Bookmark the permalink. Yummy food and pictures. I don’t eat much in the way of salads outside of the summer months instead I seek comfort foods like big pots of homemade Chicken Dumpling soup or Wild Rice Soup. Something to warm me from the inside out. Have a wonderful weekend. Yes, I am so ready for soup! Dying to try some new recipes, but it’s supposed to be in the 90’s this weekend. I like eating and growing vegetables.Your photos are so beautiful and I’m hungry now. I’d like to grow more vegetables, but we have so many trees, there’s not a lot of sun in the yard. I did grow a bunch of herbs and they did really well. I don’t mind eating salad in winter but I wouldn’t eat soup in summer. But I love soup. Those salads look very appetizing. Dil and cucumbers go incredibly well together. I thought at first it was Greek salad. I love Greek salad too, especially in Greece. They have the best tomatoes and cucumbers there. And of course, feta. Wow do those look delicious! I’m going to try the cranberry/walnut/blue cheese. Yum. I’m with you about salads in winter. I end up going with a lot of soups. I think you’ll like it. A nice combo of sweet and savory. Don’t forget the green onions. Great pics! 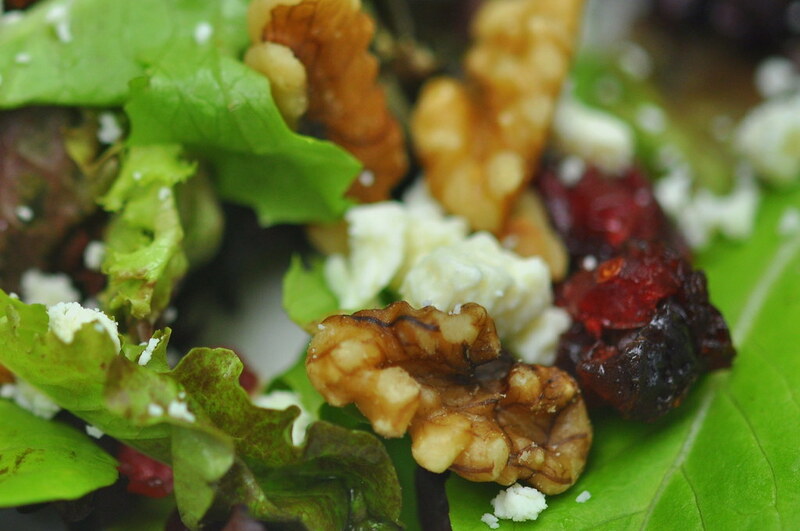 I love the walnut/cranberry/gorgonzola salads.